Irileth is a Dunmer nightblade who serves as housecarl to Jarl Balgruuf the Greater of Whiterun, and remains by his side at all times within Dragonsreach. Irileth accompanies the character to the Western Watchtower, where they slay Mirmulnir. She gives several speeches along the way to motivate her contingent of guards. She is essential, and is quite useful in the fight. Irileth wears a custom set of leather armor, along with a matching pair of bracers and boots. She fights with a Steel Sword of Cold. When attacking at range, she uses steel arrows and an elven bow, regardless of character level. She also makes frequent use of Destruction magic, namely Shock spells. Although it is highly uncommon for a Dunmer to serve as housecarl in Skyrim, Irileth and Balgruuf fought in many battles together when they were younger. 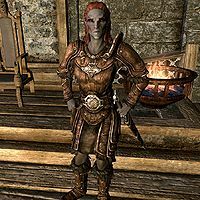 When Balgruuf was named as Jarl of Whiterun, she demanded that she be his housecarl, on account of their long-forged battle-bond. As a rule, Irileth appears to be highly distrustful of the main character, regardless of events that may take place, though after killing Mirmulnir and being declared Dragonborn she will tell the main character that she's happy that the Dragonborn is on their side, as well as saying that you are a welcome guest, but must still respect the rules of the household, once you obtain the Jarl's favor. The Official Prima Guide states that Irileth was trained as an assassin by the Morag Tong in Morrowind. Irileth's Aggression value may become set to 1 for no apparent reason, causing her, and any nearby NPCs, to attack you on sight. Commit a minor crime, such as assaulting a guard, then clear your bounty. This will cause them to stop attacking you, even in the middle of combat. Before she turns hostile, open the console and select her, either by clicking on her or entering the code prid 1a67f, then enter the code setav aggression 0. This will prevent her from turning hostile. Note that this will not work after she starts attacking you. This page was last modified on 30 December 2018, at 02:54.